Landing in Pemba, “the green island”, is like diving into another world. And diving is it! The main purpose for visitors to come to this lush, green and reserved island in the northern Indian Ocean off Tanzania is to explore the unspoiled, healthy coral reefs. With breathtaking walls made up of multi-colored soft and hard corals and the immense richness of the fish population, this is truly an underwater paradise. The 50 km wide Pemba channel separates the island from the Kenyan coast. The channel is inhabited by a great number of really big fish, therefore it is also reputed to be a prime – if not the best – big game fishing destination in Africa. Marlins, Broadbill, Sailfish, Wahoo, different Tuna species, Dorado, Giant Trevally, Tiger, and other sharks make the hearts of divers and sports fishers leap. Visiting in May or June offers a good chance to catch the humpback whales when passing the channel on their annual migration. 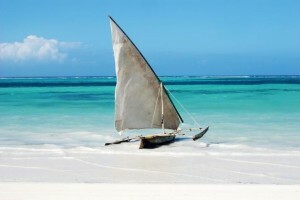 Pemba is part of the Zanzibar archipelago, consisting of Zanzibar, Pemba and Mafia Island and a number of small uninhabited islets, with the main town being Chake Chake. The shoreline is fringed by dense mangrove forests, home and nursery for many maritime creatures, alternated with pristine white, virgin dream beaches, framed by coconut forest. Appealingly, the traveler will find only a minute number of tourists sharing this unique experience. Many a day can be happily spent lazing in the powder white sand, gazing at a million shades of turquoise and watching ancient wooden sailing boats (dhows) crossing by. Only a few tourist resorts interrupt the islands everyday routine of fishing – and fishing. The main language of the visitors is fisher’s Latin and diver’s Latin, thus even the ones who dread the ‘big blue’ will somehow find themselves at the counter of a dive center one morning, inquiring for a try-out. Coral blocks in the shallow waters present themselves like aquariums, full of fearless, colorful reef fish, huge schools of surgeonfish, oriental sweetlips and snappers; bizarre (and dangerous!) lionfish in different hues; various species of anemones with their symbiotic clownfish and curious moray eels peeping out from their rocky shelter. 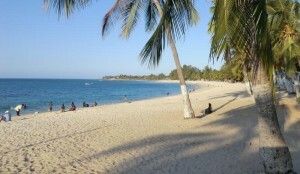 Above the sea level, Pemba has a lot to offer too. It is well worth looking out for some of Pemba’s unique wildlife. This includes the Pemba flying fox, the world’s biggest fruit bat with a wingspan of more than 5 feet, and an auburn red furry, fox-like face. The fruit bat is endemic only to this island and typically likes to reside in mangrove thickets and tropical forests. The evergreen appearance of the island is due to the vast clove plantations, fringed by rice paddies. 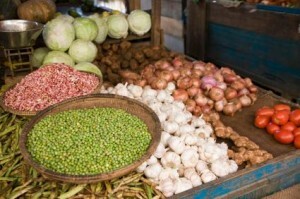 Pemba cloves are said to be the worlds best, and a spice tour is a must. Apart from cloves, the people of Pemba farm cinnamon, ylang-ylang, lemongrass, nutmeg, and other spices. Smell, see and taste – a feast for all senses! Typical Pemba souvenirs like the locally distilled clove, lemongrass and eucalyptus oil are great buys to take home and their scents will bring back memories of this beautiful island long after the holiday is over. Pemba’s rich history is reflected in the many ancient mosques, tombs, and ruins, dating back as far as the 10th century. Keep in mind, that 99 % of the population, in other words, everybody, apart from a few international staff in hotels and dive centers, is Muslim, so visitors should be respectful and not wander around in bikinis or shorts outside their resorts or the beaches, especially when visiting a village or town.